Coloured heads occupy a small but significant and fun area. Remo has finally managed to adapt its Skyndeep imaging technology to bring us coloured versions of established favourites. Coloured drum heads? Why not? In the 1920/30s era of calf vellums, the Ludwig and Slingerland factories employed highly-skilled artists who for 12 dollars would actually oil-paint idyllic pastoral scenes on your front bass drum skin! With the advent of plastic after the late 1950s heads were coated white, largely to reassure cautious drummers that they were not that different from natural cream-coloured animal skins. Once plastic was accepted widely then transparent/clear heads became popular also 0 just the Mylar film without a coating, offering a touch more sustain. But it was inevitable that bright colours would eventually be tried. Then in 1974 Evans made a splash with its oil-damped Hydraulic heads with their patented UV coloured coating. Initially favoured by Steve Gadd, the Hydraulics have enjoyed a long, if marginal, popularity, with their black, red and blue colours. More recently, Evans has added Black Chrome heads to its roster. Today, Remo’s Starfire heads, in reflective chrome or gold, are chosen for front kick heads, or for resonant heads generally, particularly as the 12 mil thick laminate has a controlled sustain. Nicko McBrain is a famous fan. So we arrive at the new ColorTones. These are available in six colours - Translucent Red, Blue, Green, Yellow, Orange and Smoke. And so far in three types: Emperor, Powerstroke-77 (P77) and Powerstroke-3 (P3). The big advance is in the way the colour is achieved. Jeff Davenport explains that the so-called Skyndeep imaging technique is, “a kind of sublimation process where the ink is printed within the plastic rather than being layered on top. The colouring is done at the Remo factory”. 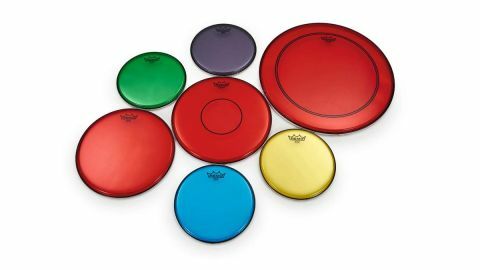 Remo has actually employed Skyndeep since 2007, particularly on world percussion heads, but Jeff reveals that customer requests were behind the reintroduction of coloured drum kit heads. Particularly - and unsurprisingly - from owners of all types of Perspex/acrylic kits. “There has always been demand for coloured heads in a popular, musical open-sounding drum head,” he explains. “To do it successfully for the mass market using DuPont Mylar has been the difficulty to overcome - they’re not easy to mass manufacture!” For snare drums there are 13" and 14" Powerstroke-77 heads, which consist of twin 7-mil plies (hence the 77) with an additional 5 mil CS dot on top and a 7-mil perimeter underlying damper ring. For toms there are twin ply Emperors in sizes from 8" to 18". On the Emperor and the P77 it is just the top ply that is coloured – the bottom ply is regular clear film. And for your bass drum, the Powerstroke-3 is a single ply of 10 mil Mylar with a 10 mil perimeter underlay as usual, available in diameters from 18" to 26". ColorTone is a significant development because with the Skyndeep imaging Remo can now make coloured versions of its established clear heads without changing the sound. And also, because of the imaging technology there is no coating to wear off. So the colour should stay consistent and the heads should play and wear just like normal clear heads. Certainly the bass drum Powerstroke-3 batter - once we’ve got over the new look - sounds like a normal Clear P-3. The Emperor batters, with their twin 7-ply construction have that familiar blippy-plastic tone with the stroke slightly softened and thickened, but plenty of resonance and volume. At present there’s just the P-77 snare batter, which again suits harder hitters. Mounting a P-77 on my nastiest snare - a 14"x7" steel job - the result is fearsome. The twin ply, perimeter-damped and centre reinforced P-77 controls the excess ring of the steel shell, but has lots of bite and power. Definitely a rocking head, not for subtly stroking jazzers. It’s interesting that Remo has launched the series with three heavyweight models. It would be good to hear an Ambassador ColorTone to assess if the colouring does affect the sound, even in the slightest. We must await further models for 2019. What’s for sure is the ColorTones are much livelier than the oil-damped Evans Hydraulics and as such they should please a hungry alternative market. Of course, if you have a Plexiglas/acrylic kit then the ColorTones are perfect. You can match the colours or go for contrast. But coloured heads can look good with any drum finish, particularly those drums with block colours. When we put Red Emperors on our Jade Green Yamaha toms it looked pretty cool.